Our world class 62,000 square foot facility houses leading edge technology used to design, engineer, machine, and measure precision optics and performance driven optical coatings. Our highly skilled teams will partner with you to take your design from concept to a finished optical component or assembly. Our standard product lines fit most optical design requirements, but in those unique cases where specific tooling, a modification or fixtures are necessary, we have the in-house capability to assist you in your specialized projects. Our ISO 9001 certified standards drive continual improvement throughout our engagement. Feel confident in our industry leading on-time delivery and fast turnaround times. Our unique electroforming process affords the production of exotic and complex shapes at substantial cost savings over other conventional manufacturing processes. Dozens of independent plating cells gives us the capacity to generate thousands of electroformed components each month. And this advanced fabrication method ensures precise reproduction of surface detail to your desired thickness and performance requirements. Electroforming allows Optiforms to consistently replicate complex forms using a single master tool. With both reusable and disposable mandrels, and materials such as nickel and copper, we can accurately replicate thin or thick walled substrates, as well as single or multi-layered substrates at a substantial cost saving over other conventional manufacturing methods. Optiforms experience in electroforming enables us to manufacture precision components for infrared imaging applications including thermal imaging cameras, heat signature, counter-measures, MWIR / LWIR and warm shields. Optiforms manufactures cold shield reflectors to your exact material, form factor, and coating specifications to guarantee the thermal performance required in IR Focal Plane Arrays and IR cameras. 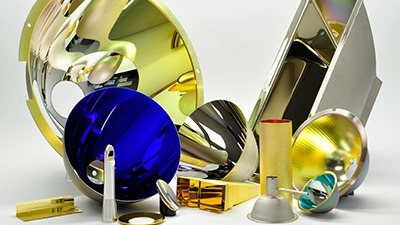 Optiforms primarily uses electroplating to enhance the reflectance of optical components like reflectors, CPCs and troughs, based on desired spectrum, visible or Infrared (IR). 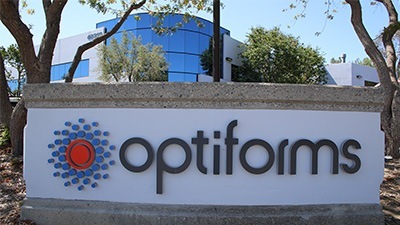 Optiforms continues its commitment to our customers by a continual expansion of our comprehensive in-house capabilities. Optical/Touch-probe CMM - The portable CMM is a measuring arm used throughout our quality control process. The arm increases our ability to inspect and verify a multitude of mechanical characteristics accurately and efficiently. Providing accuracy to within +/-0.0002", the CMM finds any discrepancies created by the manufacturing process. One of the major advantages of using the portable CMM is mobility. The CMM can be used on the granite flat or mounted directly onto the CNC equipment. This makes "in process" measurements possible and ensures our customers desired outcome. 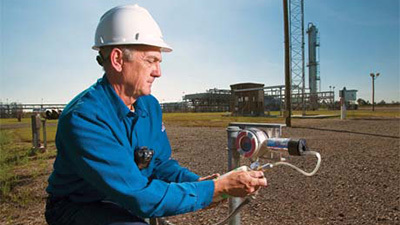 Video & Touch Probe Inspection - Capable of video inspection as well as touch probe measurement, this automated inspection device eliminates costly inspection errors by automating repetitive inspection tasks. The unit has optical and CNC measuring capability. This measuring device captures measurement data and ensures the accuracy of your component. It represents another example of Optiforms uncompromising commitment to quality and customer service. For your benefit, our approach is to include these value added capabilities into our operation. By incorporating these services along with our extensive product line we can offer substantial savings to our customers. Our experienced staff can assist our customers in creating and obtaining the highest quality, ready-for-use optical components. We are your optical solutions partner.